The attorney general isn’t giving in to fear. On January 4 — before Obama announced he was forging ahead with gun-control measures despite opposition in Congress, before his tearful East Room speech and the town-hall meeting where he tried to convince the public that he was not trying to take away their guns — the president welcomed a handful of reporters into the Oval Office. In the wake of the San Bernardino shootings, he told the reporters, he had asked his top law-enforcement official, Attorney General Loretta Lynch, along with her deputies and White House personnel, to submit recommendations about what he could do to fight gun violence via executive action. He had since received the report, he said, and was prepared to act on the recommendations. Lynch, who was seated directly to his right, said nothing while the cameras clicked. In the brief clip that ran on networks, the cameras zoomed in on the president’s face, cutting her completely out of view. She appeared at the East Room event the next day, again off-camera. When the president conducted his live town hall later that week, she was absent. 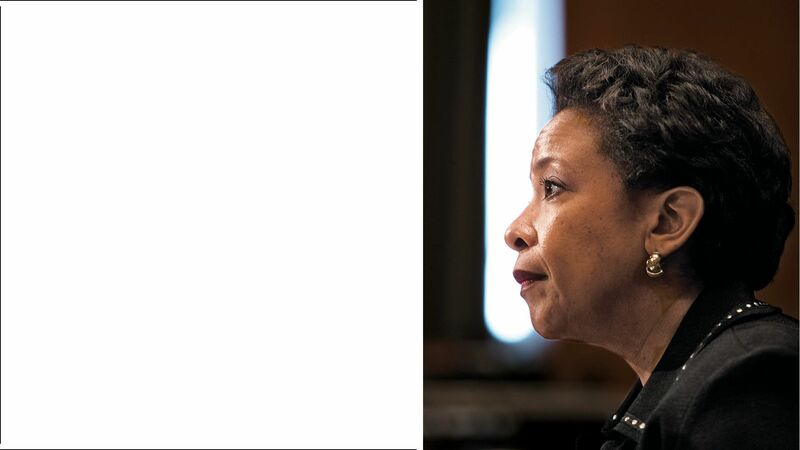 Staying out of the spotlight has been as much professional strategy as personality trait for Lynch, who may be the lowest-profile attorney general in recent memory. Over the course of a long career in the U.S. Attorney’s office in the Eastern District of New York, she managed to ascend to the top law-enforcement position in America without arousing much attention or creating controversy. But the Obama-Lynch tableau will almost certainly become more familiar in the days ahead, because the president’s new gun-control proposals will be the greatest test of her short time in office. The crux of Obama’s new policy is, for the most part, merely a clarification of current law: Gun sellers, or those “engaged in the business” of selling firearms, are required to run background checks—including online and gun-show sellers, who have previously claimed that they’re exempt, and who have historically been left alone by law enforcement. Those who fail to run background checks are subject to prosecution. Which means that it’s up to Lynch, and the Department of Justice, to prosecute the offenders. Gun control is by no means the only issue for which Obama is relying on the legal maneuvering of the Department of Justice to safeguard his agenda. The White House’s terrorism, national-­security, hate-speech, corporate-crime, civil-forfeiture, and refugee policies all flow through the office of the attorney general. In other words, with just a year left in his administration, no one will be more central to the president’s political ambitions and legacy than Lynch. To the extent that most people think about attorneys general at all, it’s usually as avatars of the most controversial policies of their presidents. Holder, beloved as he was by Democrats, was so hated by the right that he became the first sitting Cabinet member in U.S. history voted in contempt of Congress. Michael Mukasey will forever be remembered by Democrats as the guy who defended the legality of waterboarding for the Bush administration. Alberto Gonzales went down in flames over the politically motivated firing of nine U.S. Attorneys. John Ashcroft’s legacy as champion of the Patriot Act still reliably turns up screaming protesters at his speaking engagements. Even Janet Reno, the consummate government bureaucrat, ended up as one of the right’s top partisan punching bags during the Clinton administration, second perhaps only to Clinton himself. Lynch says she views issues of racial justice, including the relationship between minority communities and the police, “as a societal issue that every generation really has to struggle with,” and it is an outlook born of her own lived experience. She was born in Greensboro, North Carolina, to a librarian and a fourth-­generation Baptist preacher, in 1959. A year later, four students sat down at a Woolworth’s counter in the North ­Carolina city and sparked civil-rights ­protests across the South. When Lynch was growing up, her father would welcome activists planning protests to his church, carrying his young daughter on his shoulders. She faced plenty of discrimination, too: In elementary school, when she got a high score on a standardized test, school ­officials asked her to retake it. As the valedictorian of her high school, she had to share the honor with a white student because administrators feared she would face racist backlash. Lynch later attended Harvard, joining the cheerleading squad and becoming a founding member of the school’s chapter of Delta Sigma Theta, a prominent black sorority. After law school, while working in the Eastern District office, Lynch prosecuted several major cases. According to Lynch and her colleagues, the most formative experience of her career came when as a lawyer in the U.S. Attorney’s office, she helped lead the prosecution team in the case against officers involved in the assault of Abner Louima, a Haitian immigrant living in New York, who in 1997 was arrested in East Flatbush. Once in custody, he was brutally beaten by police, culminating in a sexual assault with a broom handle in a police-station bathroom. It’s one of the cases that came to define the late-’90s-era protests against police brutality in America. Though Lynch was technically his senior, she deputized Ken Thompson, now the Brooklyn district attorney, to give the opening statement. “It was a shock to me,” says Thompson, who was then a junior prosecutor. “It was the biggest case any one of us had at that time, and most people would have wanted to deliver it, because it was such an important case to the city and the country. She was looking at the big picture.” Thompson, she ­reasoned, would better represent the voice of Louima to the jury. What that taught her, and what guides her now, is a sense that often the people who seem to be on opposite sides of an issue aren’t necessarily opposed. “Everybody wants to be able to call the police when you’re in trouble. Everyone wants to feel that they have someone they can call to protect them. What I heard from a lot of people in a lot of communities in New York was, they didn’t feel they had anybody to call. That’s the real danger when you have a lack of trust between law enforcement and the community,” she says. 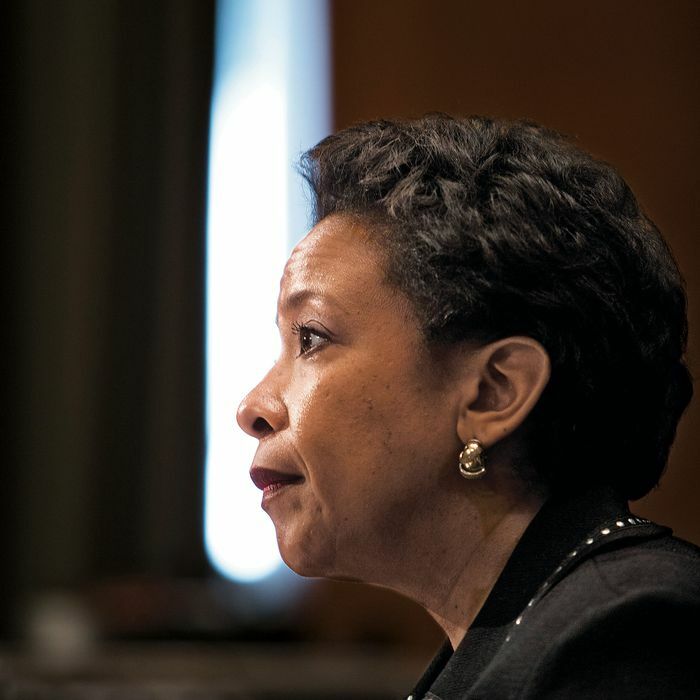 Lynch’s department is investigating the police departments in Chicago and Baltimore. In both cases, the pressure to deliver justice is enormous. Meanwhile, on both terrorism and gun-control issues, she’s working to balance concerns about personal security and civil liberties. Her agenda would be ambitious even if it weren’t coming amid what amounts to a national freak-out about public safety — whether the fear is directed toward guns, the police, terrorists, or the government itself. “I understand people are concerned. I understand that they’re afraid. It’s human to feel that fear and that concern. People want to be safe — I understand that—that’s why I’m here. That’s my job,” she says. But as she’s watching the country flip its collective gourd, she’s concerned, she says, “that people, out of understandable fear and concern, are falling into this trap, are falling into a rhetoric and a dynamic that our enemies want us to have. I always resist that.” In that way, Loretta Lynch is much like her boss: She refuses to freak out. *This article appears in the January 11, 2016 issue of New York Magazine.